Draclings are a form of Screechling that have been enchanted with elemental Shade. These shadowy creatures seem to be found in abundance within the dark mortuaries of Wormwood Hollow. As a form of defense, Draclings let out a piercing shriek that would make a banshee cower in fright. 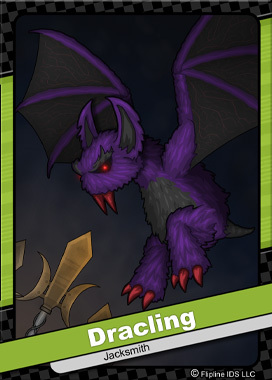 Other Screechling varieties include Flarewing, Aquabat, Polarbite, Meteorfight, Cloudrat, Shockbat, and Maplefang. All of these Draclings are under the complete control of the great wizard, Dudley.